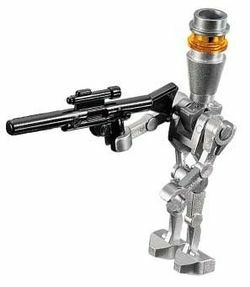 An Assassin Droid is a minifigure from the Star Wars theme, first released in 2008. The Assassin Droid to date has had two variants- a white version, released in the set 10188 Death Star, and a silver version first released in the set 8015 Assassin Droids Battle Pack. The white version of the Assassin Droid has plain white pieces, except for one transparent orange stud used in the head, and a black clip piece used to join the head to the body. The head is made up of the black clip, a white cone which is attached to the clip, the transparent orange stud to represent photoreceptors, and a white stud on top for the top of the head. The torso, legs and arms are all the same as the pieces used in a standard Battle Droid, but in white. Both arms on this droid are bent and have hands that are parallel to the body. The second, silver variant initially released in 2009 is similar in makeup to the original, except all of the black and white pieces were changed to silver. Additionally, one arm is turned so that the droid is able to hold a blaster or a blaster rifle. IG-86 sentinel droids were a model of sentinel droids designed to act as bodyguards or security droids, however were often also used as assassins. Ziro the Hutt made use of these droids during the Clone Wars, as did the Confederacy of Independent Systems in some cases. These CIS IG-86 droids often rode speeder bikes into battle. After the Clone Wars, IG-86 sentinel droids developed into IG-88 assassin droids. This page was last edited on 15 March 2016, at 18:34.